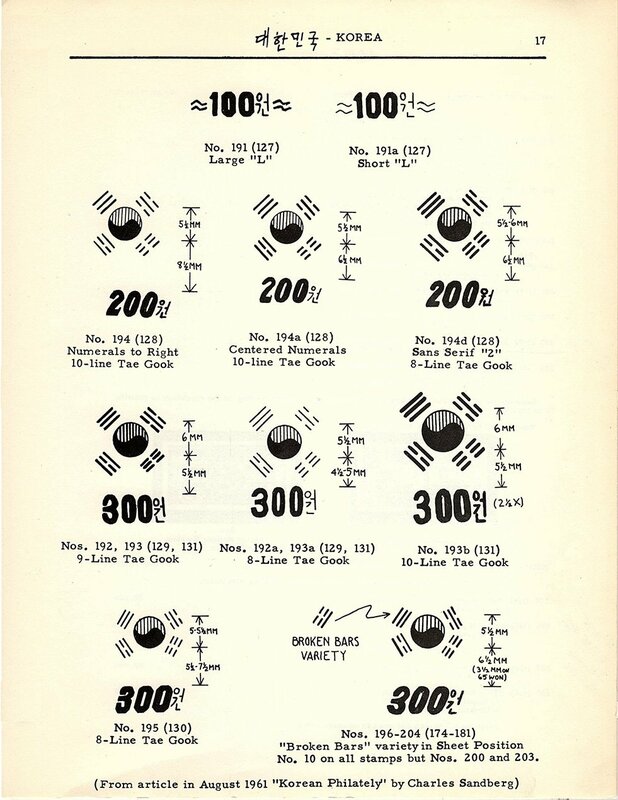 One of the most detailed catalogs for Korean stamps (not including the Korean Empire), was published for the first time in September, 1959 by Commander L.L. Dilley , USN (Ret.). Commander Dilley, seen here in a photo from World War II, was in the Cryptanalysis Section of Fleet Radio Unit Pacific (FRUPAC) based in Hawaii, and charged with the intercepting, decrypting and analysing of Japanese messages and media. 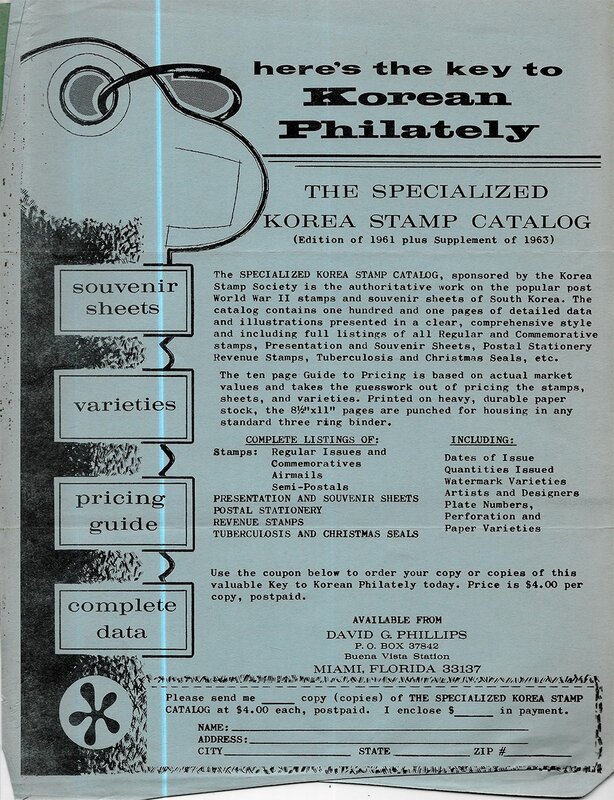 Commander Dilley’s skills obviously helped him in publishing the Specialized Korea Catalog when he became an avid collector of Korean stamps. Original caption: “Lieutenant Commander Luther L.L. Dilley, USN Cryptanalysis Section, FRUPAC.” Photo taken mid-1943? See United States Cryptologic History Series IV World War II Volume 8, page 64. 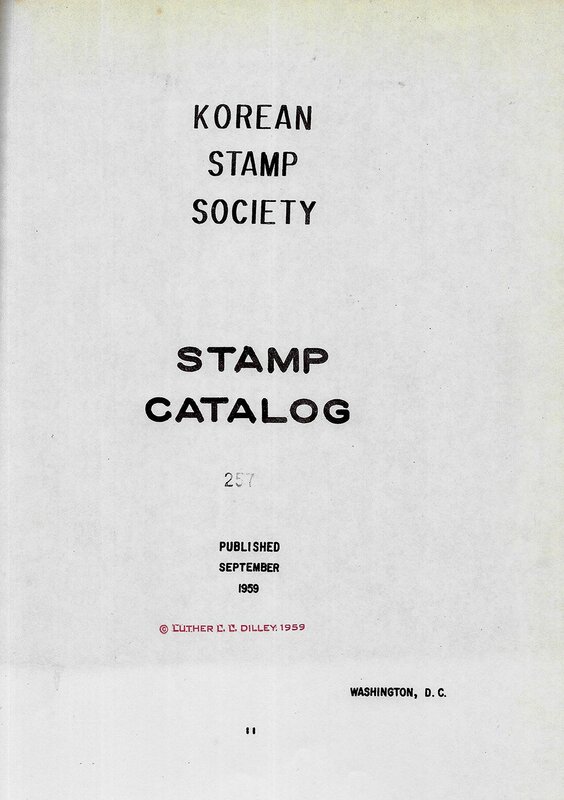 The publishing period of the catalog was short lived, but it was a very valuable asset to Korea Stamp Society (KSS) members in the early 1960’s. 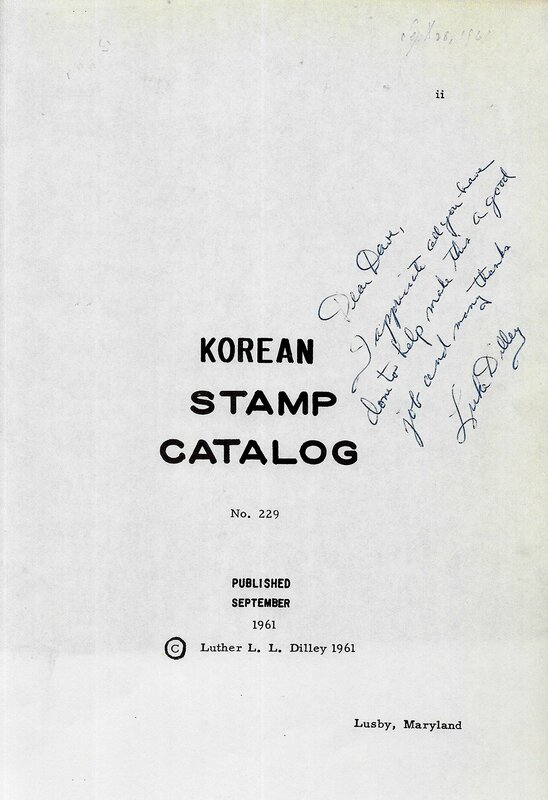 Robert Jones, president of the KSS, stated in the November 1961 issue of Korean Philately on page 86 that: “While Mr. Dilley’s catalog is a private endeavor, and produced at his own expense, it is a work of vital importance to the KSS.” (See below for complete citation.) 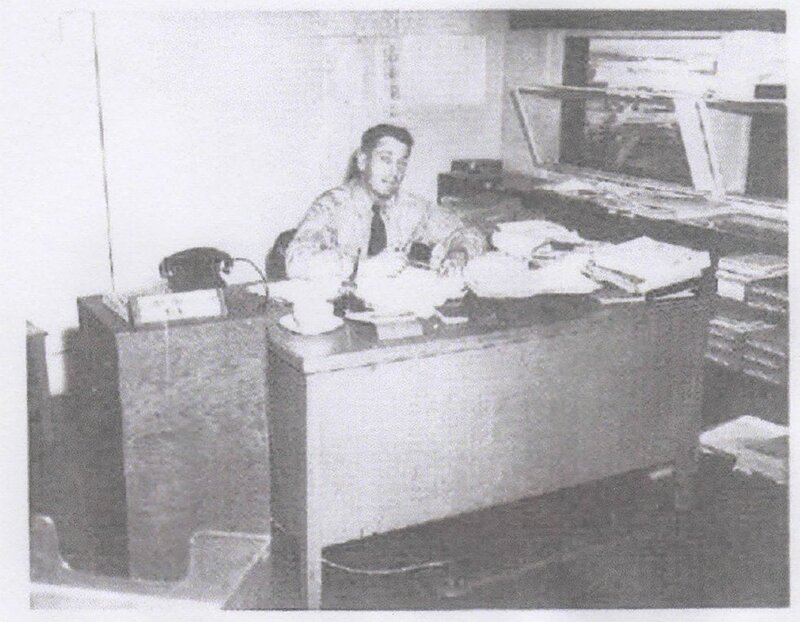 Commander Dilley was also the Sales Manager of the KSS from October, 1959 to February, 1965. The publication of a comprehensive specialized stamp catalog is an important philatelic achievement, and to a large extent signals the coming of age of the philatelic material under study. 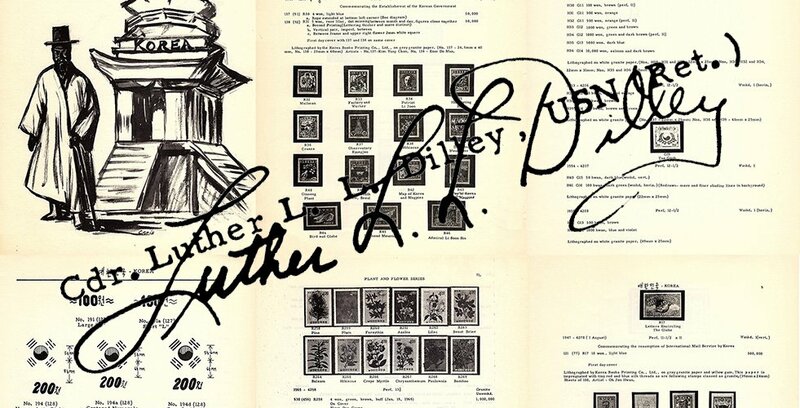 Since such a catalog represents a high degree of research and knowledge, the philatelic material itself, of necessity, takes on added significance and value. 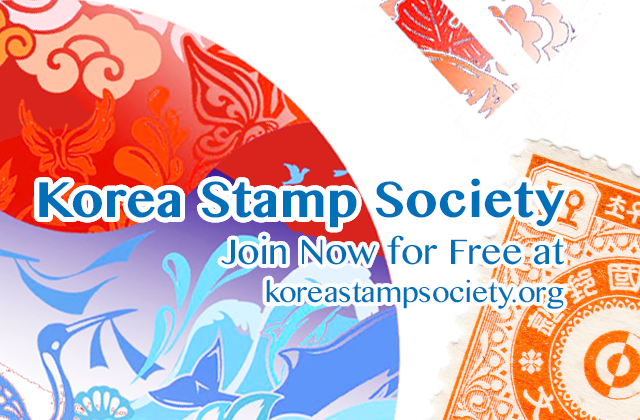 The membership of the KSS has long hoped for such a catalog of the stamps of Korea, and from the early issues of KOREAN PHILATELY there have been repeated requests for such a reference work. The task itself, however, awaited someone with the sources of information, energy, and patience to tackle the job in the face of the advance knowledge that it would be a largely thankless, and almost certainly a money losing effort. While there are a number of members of the KSS who might have undertaken the work, the project lay dormant until, several years ago, Mr., Luther L. L. Dilley accepted the formidable challenge. The first fruits of Mr. Dilley’s efforts are familiar to many of us in the form of the first Korea Specialized Catalog which appeared in September 1959. Even before the release of this first edition it became obvious that a revised edition would be necessary. New material was reported, further research was done, and several members of KSS contributed significant information. The present result is a new and much more comprehensive catalog with a greatly improved format and illustrations. While Mr. Dilley’s catalog is a private endeavor, and produced at his own expense, it is a work of vital importance to the KSS. 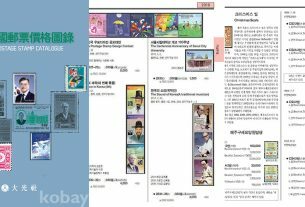 Obviously, the catalog is a major factor in the promotion of Korean philately and thus it is closely linked with one of the major objectives of the KSS itself. 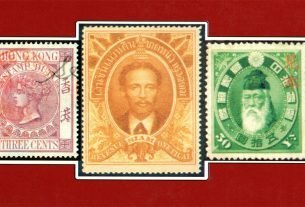 For the first time in the ten year existence of the KSS we have a comprehensive, systematic, and authoritative reference work on the stamps of the Republic of Korea, including the regular issues, commemoratives, airmails, souvenir sheets, revenues, postal stationery and Christmas seals. 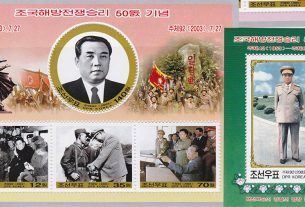 Since there is no “royal road” to philatelic knowledge, especially in the case of Korea, there is still some factual information lacking. Nevertheless, the present edition of the catalog is a must for the Korea collector, and it: will be supplemented by new information and addendas which will appear in future issues of KOREAN PHILATELY. For the time being, the Empire issues are not included in the catalog. A thorough listing of these complicated issues requires the special knowledge which we know is available to only a few members of the KSS, and it to be hoped that they will come forward to share their knowledge with others. The new catalog is a tremendous forward step for Korean philately; the KSS expresses its grateful appreciation to Mr. Dilley, and in expressing its approval of his fine work it urges every member of the Society to avail himself of the opportunity to obtain a copy of this valuable reference work. In February, 1965 rights to the Commander Dilley’s catalog were sold to the KSS and the remaining copies were sold to the KP editor. It was not published again. Commander Dilley also sold all of his philatelic stock of Korean stamps were sold and he retired from collecting. At long last comes the revised and enlarged edition of the Korean Specialized catalog. We had hoped that the Kingdom issues would be included in this section but it was not to be. Perhaps later on this year it can be done. 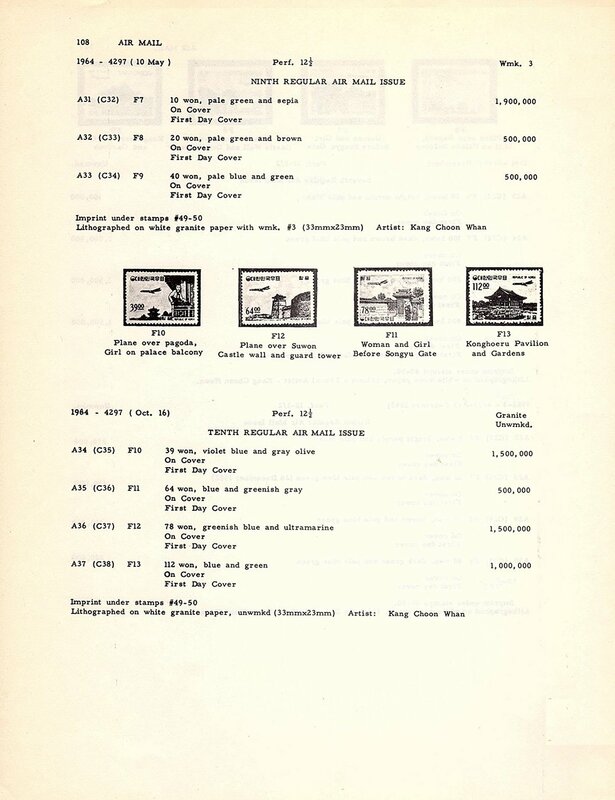 This part of the catalog, however, includes the general issues, semi-postal, airmail, souvenir sheets, postal stationery, revenues, first day covers, and tuberculosis seals. 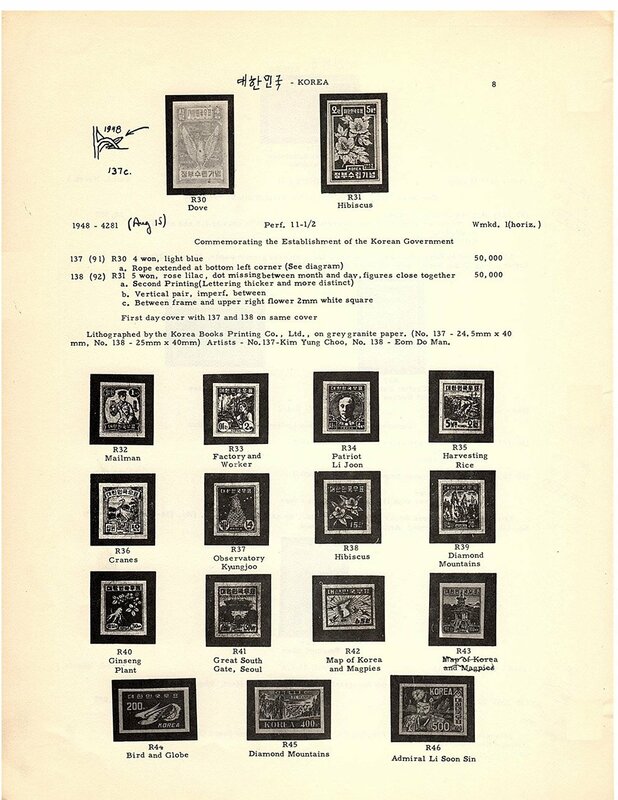 Permission was obtained from Scott’s Publications to use Scott’s Catalog numbers for reference, which will facilitate identification of the stamps. Here, we have again tried to list all of the known varieties, but know that some will be omitted in spite of everything. In this edition, however, room has been left to include additional varieties by double spacing and by leaving room between the different sets of stamps. The catalog values have been omitted from the catalog now so that the catalog can be published without further delay. 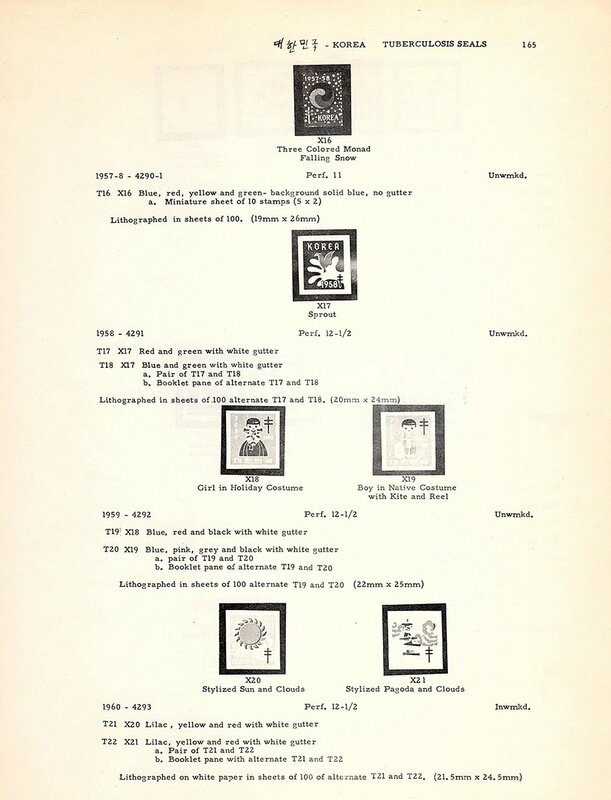 A catalog value or price list will be circulated to those members who have taken so much of their time in the different sections of the catalog. Perhaps by the time the Kingdom issues are published the catalog values or price list will be completed and can come out with that section. The material in this catalog is the work of many of the members. 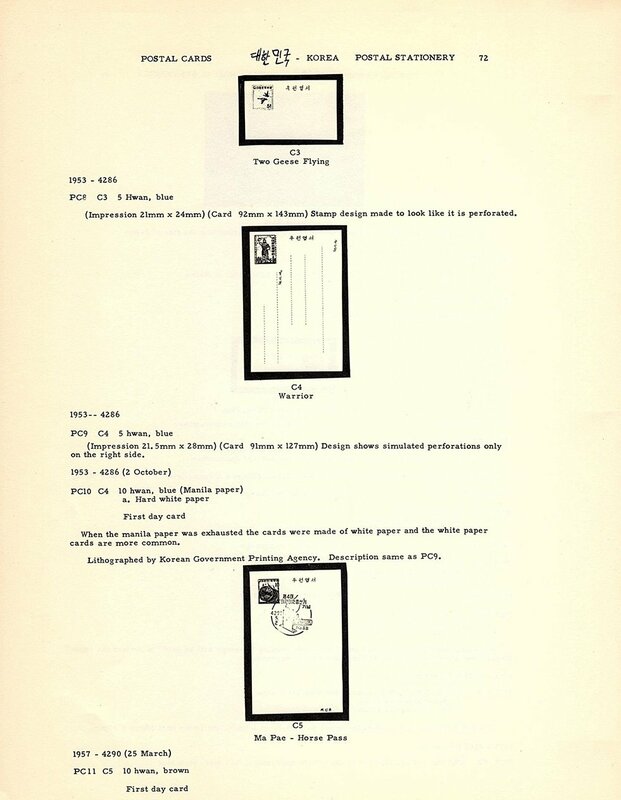 Bob Jones submitted the write-up on the Revenues and the Postal Stationery, some of which had previously appeared in the “Korean Philately” from time to time, and from the articles of Don Redlich. The Provisional Inflationary stamp issue write-up by Charlie Sandberg in the August 1961 “KP” was a big help in that area. Charlie’s diagrams of the different type surcharges are included in this catalog. His work has been a big contribution to specialists on Korean stamps. Bob Peterson forwarded an article from “Oo Pyo”, The Korean Philatelic Society’s official paper, on Air Mail issues, which was a decided help. Mrs. Lura McLane Smith and Mrs. Helen Zirkle furnished the information from which the tuberculosis seal section was written. Paul Crane has been instrumental in identifying buildings and structures on stamps, translating text, showing up with heretofore unknown varieties and assisting in many other ways. Others who have been helpful in locating varieties are Ralph Gould, Howie Maxcy, Bob Jones, Charlie Sandberg, Alex Dickie, Dave Phillips, Lyman Hale, Albert Thievierge, Arthur Korzyn, and from Korea, Father Richard Rutt, Lee Chang Sung, Lee Kwan Hwee, Kim Su Hyon, and Mr. Hwang of the Korean Philatelic Society. We deeply appreciate all of this help for without it the catalog would not be nearly as complete as it is. An enlightening trip was made to Arthur Korzyn’s place where much needed information was given on heretofore unknown imperforates, more information on plate numbers, imprint positions and many other varieties. Now for a few words about the catalog. In the first column of figures are this catalog’s stamp numbers. The numbers in parenthesis in the second column are Scott’s Catalog numbers. The numbers in the third column are the of the illustrations. In the case of imperforate stamps, only valid imperforate stamps known have been listed. 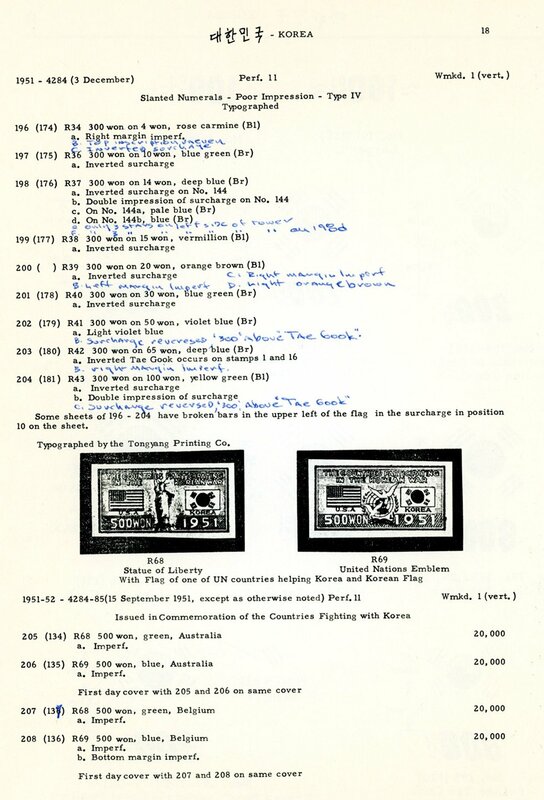 In the catalog value or price list, the imperforate a r e valued only in pairs. Copies cut from souvenir sheets are not recognized as valid imperforate varieties of the general issues. The Korea Books Printing Company, Ltd., noted in the earlier issues was later called the Korean Government Printing Agency. 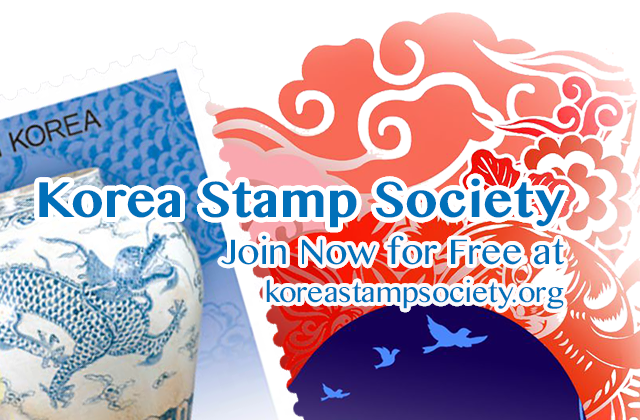 Again, the Korean Stamp Society wishes to thank all of you who have helped make this catalog possible. Fig. 1: Example of page with postage stamps (1948). Fig. 2: Details of the 1951 surcharges. 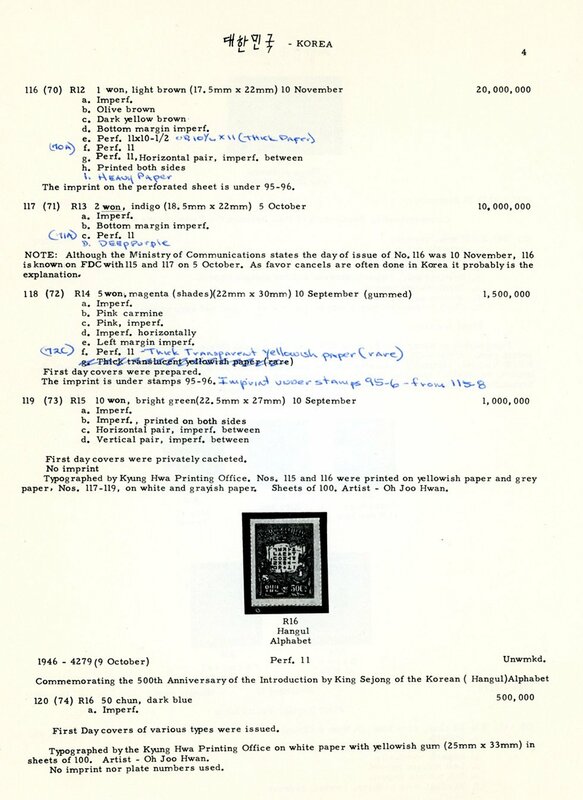 Fig 6: Hal Klein’s annotations on page 4. Notice how many things were added over the years, showing how well-used this catalogue was by some of the KSS membership. Fig 7: Hal Klein’s annotations on page 18. Here too a lot of new information was added over the years. Page ii from 1959 edition. Page ii from 1961 edition, with text from Dilley. Dilley selling his catalogue and album. 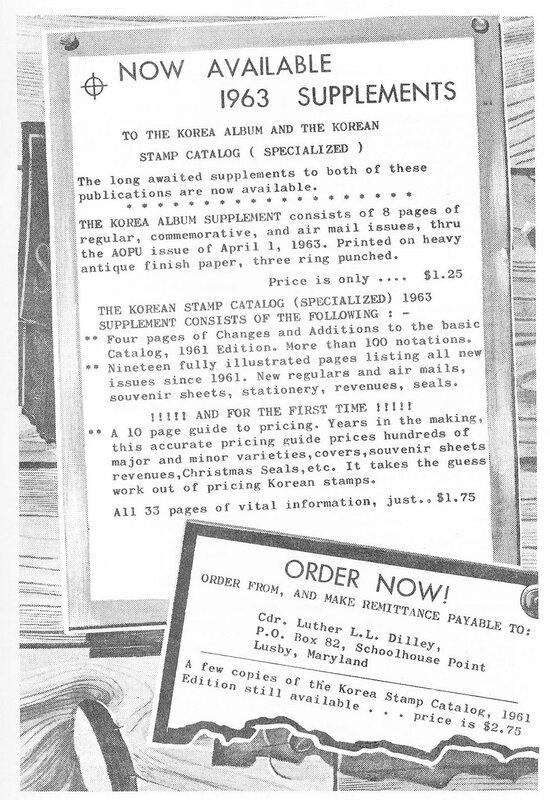 The advertisement made by David Phillips for the 1961 edition with 1963 supplement. Note that only KSS members can actually download these files but becoming a KSS member is for free and applying can be done online in a matter of minutes. By becoming a member you get access to all the pages/articles on the KSS website including all (scanned) publications already online. And even more is coming soon! Hi Ivo, this article Dilley’s catalog came very well and is interesting, in itself, for the history of the members of KSS.